Spring-cleaning out your scrap stash will be amazing and fun with this miniature quilt design. Just think of all the color combinations you will have available by sorting those scraps! 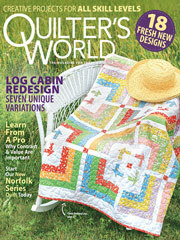 This e-pattern was originally published in the Spring 2014 issue of Quilter's World magazine. Size: 16" x 16". Block Size: 2" x 2".